Dedicated to E.E. "Doc" Smith and the Directrix. Not to mention the Skylark of Valeron. Science fiction fans and authors of SF novels have often wondered "where everything is". Is Sirius closer to Procyon than Tau Ceti? Is 82 Eridani safely within the Terran Federation, or is it perilously close to the dreaded Blortch Empire? And just where exactly is Babylon 5? 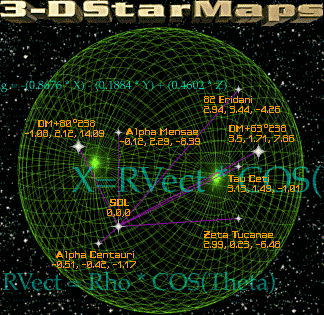 "Hard" SF writers and interstellar game designers need reasonably accurate 3-D starmaps in order to set the stage. This webpage is a feeble attempt to assist those who lack the knowledge (or inclination) to do the work themselves. You don't have any excuse now, I've done most of the work for you! If nothing else, grab the maps! If you are allergic to math, you might want to skip ahead to the utility programs and sample maps. 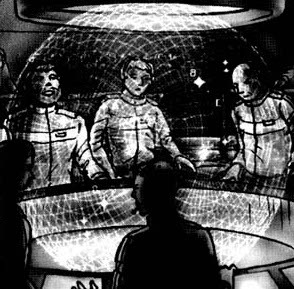 As for me, I would settle for a 3-D mapping set up like the mission control center featured at the start of the movie STARGATE. And don't miss the sister website on the topic of Atomic Rockets.